I have yet to meet a dog yet who doesn't love ice cubes, and the Lapdogs are no exception. When we heard about the Freezy Pups Kit, they couldn't wait to get their paws on it for review! It's time to take our pup's ice cube treats to the next level with the coolest treats around. The Freezy Pups Kit comes from Head of the Pack, a company based on the simple idea of developing a unique and different type of dog treat made from "good stuff." Founder Heather Klemm, a professional dog trainer and behaviorist, observed how often her clients gave their dogs ice cubes as snacks but always thought plain water was a little boring. She suggested they mix healthy ingredients into the water to give it added flavor and her clients raved about how much their dogs LOVED them! The positive reaction inspired Heather to create a treat that dogs found tasty and fun to eat, as well as one that was fun and easy for the owners to make. The Freezy Pups Kit includes an adorable bone-shaped ice cube tray and a one-use packet of each of the four organic flavors: Chicken Soup, White Cheddar Cheese, Juicy Apple and Sweet Potato 'n Maple. All of the flavors are wheat, corn, soy and gluten free and contain no preservatives, artificial colors or flavors. And, you know the Lapdog household loves that they are Made in the USA! These treats couldn't be easier to make! You simply mix one flavor packet in 7 ounces of hot water, then pour the mixture into the tray. Place the tray in the freezer and ... now this was the hardest part for the Lapdogs ... wait. Once frozen, you can serve as is or use them to add moisture/flavor to your dog's food (just melt a couple of cubes into your pup's kibble). Each treat is less than 4 calories, so you can feel good about feeding them freely! The Lapdogs have always been huge "icy" fans, so when you add tasty flavors to the mix, they clearly think icies rock. They have given the Freezy Pups Kit their Official 16 Paws Up Seal of Approval... or maybe that's 20 paws up because their foster brother Bentley threw in an extra 4! Little Ben thought the apply icies were the bomb! 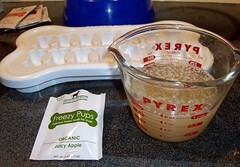 Is your pooch ready to try some Freezy Pups treats? Order your kit today and while you're there, grab an extra and start your holiday shopping early! The kit retails for just $19.99 and refills of each flavor are available at $8.99 each. Thanks to Head of the Pack, we also have the opportunity to give one lucky reader a free kit!!!! You can get extra entries by completing step 3 and/or 4, as well as by sending your friends here to enter (be sure to have them mention your name).... blog, Tweet, Facebook and text away! Deadline for entries is Saturday, September 17th at midnight. Hmmm... I don't know that the fur-girls do love ice, but I'm delighted to see that the mix is corn-free and the flavors include Sissy-approved versions. LOL just love the sweet open mouth taking the treat so nice!!! What a cool idea! Love it! My dogs love to eat anything, but it's funny to watch them eat ice or frozen treats. They think it's such a bonus the freezy pups kits are free of bad things for their health! My dog Walter the Pug followed Freezy Pups on twitter and liked their FB page. My 11mo old Maltipoo, PipSqueak, loves ice cubes so much that if you go to the freezer and not "accidently drop" and ice cube for her she'll howl like- Um.. did you forget someone?! She's love this!! My dog raster loves ice cubes. When he hears us getting them from the fridge he comes running and looking for his! Those are so cute. My pack all love to chew on and eat ice so these would be fun for all of us. By the way, my tee shirt arrived and is adorable. Thank you. I'm sure it'll get a lot of use this fall. (leaving my second entry comment) I had already "Liked" the Freezy Pups Kit on Facebook! That's what brought me to your page! Yay! Now those are a cute idea. Don't consider this an entry, unless it's for G or Chan. One more time, her is following dem on Twitter now too. (WeFan) ok I am done now. What a great idea! Max, Sam and LittleDog love ice cubes. Right now they're getting little heart shaped ones but I'll bet bone shapes would be way tastier. Thanks for the tip Nic! Have a great weekend. Okay, now that's just a great idea. :) Micro always snags the ice cubes that the kids drop on the floor when they fix a drink, so he must think they're pretty awesome, too. Off to check out their website. We 'like' Freezy Pups on FB.